While millions of people visit Grand Canyon National Park each year, few people realize the complexity of the Grand Canyon’s formation. If you want to add interest to your Grand Canyon bus tour, you need to book travel to the South Rim and the Rim Trail. A portion of the trail features the Grand Canyon Trail of Time – a part of the path that allows visitors to learn more about the Canyon’s geological timeline. Each part of the approximately 1.5-mile trail displays timeline markers, each of which is a meter or 37.37 inches apart. The markers take walkers through the Canyon’s one million years of geologic history. Samples of rocks appear along the path at points where they emerged geologically. Walking the Rim Trail on the South Rim and reviewing the displays at the Grand Canyon Trail of Time will give you pause to think. If you plan to trek the Rim Trail during a Grand Canyon bus tour, you will want to review the markers on display that tell about the Grand Canyon’s geological history. Doing so will lead you on an educational detour you were not expecting. For example, the Kaibab rock formation happened 270 million years ago. Tapeats sandstone developed over a period of 525 million years and Vishnu basement rocks took about 1,800 million years to form. While these rocks are indeed ancient, the canyon itself is young by comparison. Excavation of the Canyon walls happened about 6 million years ago. No one knows, at this point, how the Colorado River ended up weaving its present course through the Canyon. 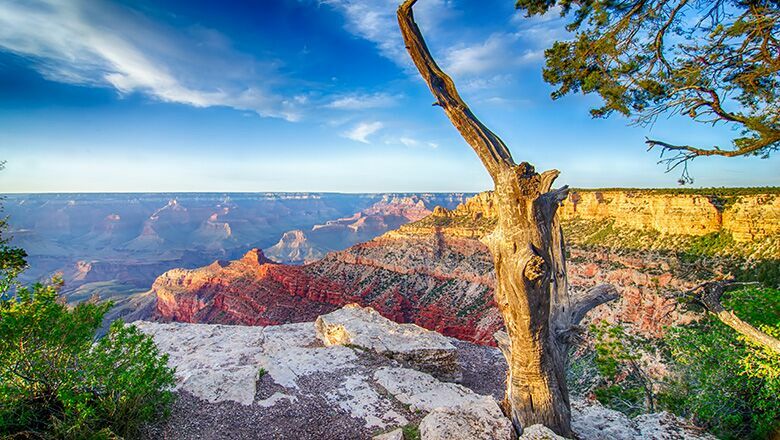 By walking the Grand Canyon Trail of Time, you will marvel at the carving of this natural wonder. Learning the geological facts about the Canyon’s formation will give you plenty to consider. The path features a maximum elevation of almost 7,000 feet and a minimum elevation of about 6,800 feet. Therefore, the elevation range is about 200 feet. Besides learning about geological formations and rocks, you can also burn calories when hiking along the trail, especially if you take the path in either direction. The Trail of Time involves taking about 2,150 steps and takes about 20 minutes to walk.